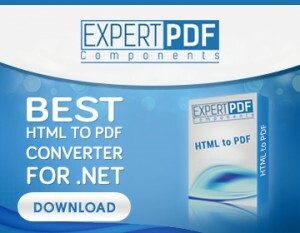 ExpertPdf Html To Pdf Converter is an easy to use library for .NET, capable of converting html from files, streams, urls, strings to high quality PDF documents. ExpertPdf has been optimized to be used on servers where speed and memory usage are critical. Having thousands of customers all over the world, ExpertPdf does its best trying to stay up-to-date, fast and reliable. Because of that, we are constantly adding new features to our products and fixing any problem our customers might have. ExpertPdf Converter v9.2 was released yesterday.